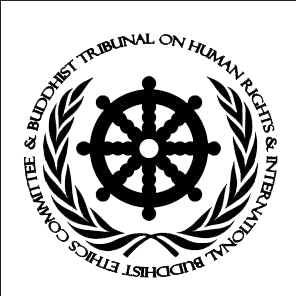 Given the attacks of the civil or governmental terrorism, Buddhist Spirituality responds following the rules of non-violence, which consists of the Path founded by Gautama over 2600 years ago. This pacifist position is a non-conventional response against violence; it is not an attitude of passivity, but involves an objective and detached response that always starts from the perception of the Real. When terrorist attacks occur presidents usually require taking military measures, which is undoubtedly a regression to a savage, primitive and irrational pre-humanity. The spiritual master helps people to recognize that this way of violence is far from any kind of justice, since it is oriented toward hatred and chaos. Instead, throughout twenty centuries nonviolence has been the stubborn companion way of the Buddhist Spirituality, conveying humankind certain ethical rules which form the most important lesson of history. This learning implies being disappointed about the bellicose, technological and materialistic progress, which is actually an illusory progress, in order to approach a real and true progress that enables to move forward and evolve in life. In this sense, Buddhist Spirituality shows that the dualistic logic is primitive, conflictive and violent, while the dialectical paradoxical logic is superior, conciliatory and pacifist. This kind of knowledge is the only progress in the world, because it leads to welfare and harmony, while materialism always leads to disappointment and nihilism. Therefore, Buddhist Spirituality always starts from an optimistic premise, as it shows in the here and now how to clear the illusions of the past and move towards progress of the future. The idea of the Awakening (Bodhi) of the subject and society has a certain consistency and coherence which are not present in religion and politics. The spiritual master calls to a kind of evolutionary culmination of consciousness, calling people to spiritually grow. This progress is to find vocation and Purpose (Dharma) of human beings and of the very life, by keeping the hope for a better world despite the fact that mundane conditions are pessimistic and they contradict any optimism. But the attitude of progress can be maintained to infinity, reason why the Free and Enlightened Being (Arhat-Bodhisattva) competes with the idea of God, developing a vision of existence that is dynamic, comprehensive and conciliatory, since it is beyond the illusory contradictions. In this overcoming the values of Liberty, Equality and Fraternity are located; which is what Buddhist Spirituality practices and teaches, going beyond the two destinations of metaphysics and materialism. Starting from the space and time of the Openness (Sunyata), the spiritual master transcends dualism and exists in the real liberation, which is the most important moment in history, because it is the only moment of genuine peace. This is the reason why the promise of freedom coming from the Buddhist Spirituality is an insistence to rebel against a world where violence is something normal. Thus, for the Free and Enlightened Being (Arhat-Bodhisattva) to be moved away or left out from the destination of history is something that benefits humans. But while this may seem a-historical attitude, certainly the Buddhist Spirituality never has been indifferent to the world, because it is an adult, committed and peaceful community. Furthermore, the position of leadership and guidance of the spiritual master is yet to happen in history, because humankind has the whole future ahead, being in the ascendant path of the evolution of life and consciousness. Indeed, humanity and the Earth (Gaia) are both found in childhood since they have not yet realized the meaning of their lives as superorganisms or interrelated totalities. But the sense of the Buddhist Spirituality is the path itself, its practice in the world, by keeping a relationship of commitment with Human Rights and Nature. The day when people choose to be non-violent, only then they will inherit the greatness of Cosmos.